Nashville, TN – The Gettys are scheduled to perform on Thursday, February 25, at the NRB International Summit and Friday, February 26, at the Closing Gala & Awards Dinner of Proclaim 16, the NRB International Christian Media Convention in Nashville, TN. Among the songs they'll perform will be their newly-released hymn, "Facing a Task Unfinished." 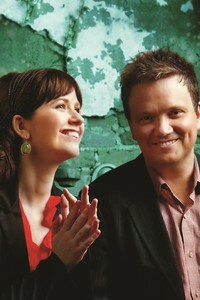 Keith and Kristyn Getty occupy a unique space in the world of music today as preeminent modern hymn writers. They have created a distinguished catalogue of songs, reinventing the traditional hymn form by writing songs that teach Christian doctrine while crossing musical genres, connecting the world of traditional and classical composition with contemporary and globally accessible melodies. The repertoire of Getty hymns (many penned with long-time writing partner Stuart Townend) includes “In Christ Alone,” “The Power of the Cross,” “Christ Is Risen, He Is Risen Indeed,” “By Faith,” and scores of others. Their hymns top CCLI rankings, national “most-loved” and “most-sung” lists, and are estimated to be sung by 100 million people in churches around the world each year.